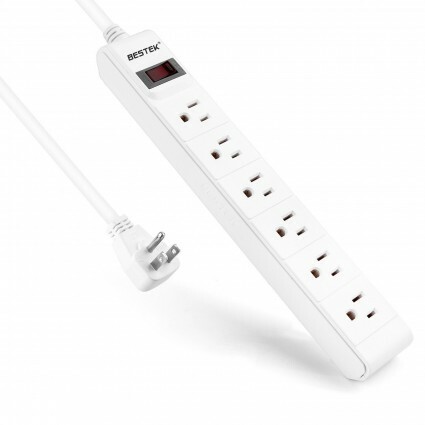 BESTEK surge protector power strip is designed with 6 wide AC outlets with 6-foot power cord, enabling you to power up your home and office devices at the same tine easily and reduce unnecessary clutter. The surge protector is designed with 6 outlets, allow you to charge 6 devices at the same time, perfect for professional laptops, computers, general electronics and home appliances. With 6-foot long 14-gauge heavy-duty power cord for flexibility in placement, power strip cable is useful for extended range without unnecessary clutter. Lighted power switch with an integrated 15-Amp circuit breaker signify your devices are protected from power surge, over-heated, overload, over-charging. The USB power strip is small-sized and space-saving, can help reduce home and office clutter. Portable strip and detachable cord, can be wrapped into your bag and luggage.